The study of singers' art has emerged as a prominent area of inquiry within musicology in recent years. Female Singers on the French Stage, 1830-1848 shifts the focus from the artwork onstage to the labour that went on behind the scenes. 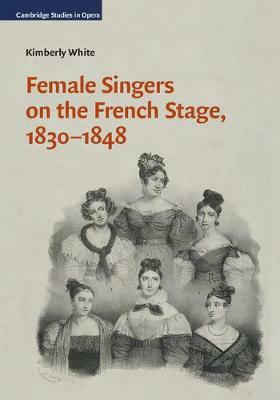 Through extensive analysis of primary source documents, Kimberly White explores the profession of singing, operatic culture, and the representation of female performers on the French stage between 1830 and 1848, and reveals new perspectives on the social, economic, and cultural status of these women. The book attempts to reconstruct and clarify contemporary practices of the singer at work, including vocal training, débuts, rehearsals and performance schedules, touring, benefit concerts, and retirement, as well as the strategies utilized in publicity and image making. Dozens of case studies, many compiled from singers' correspondence and archival papers, shed light on the performers' successes and struggles at a time when Paris was the operatic centre of Europe.